Bethany and I are pleased and proud to introduce you to the newest family member: Peter Ambrose Stevens. 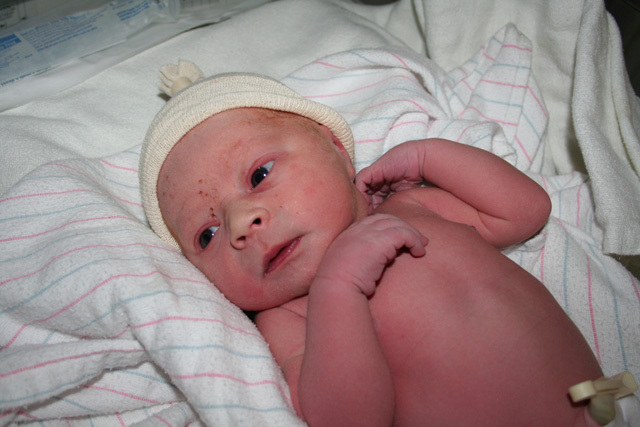 Peter Ambrose’s birthday is March 12, 2010, and he was born at 1:32 p.m. He weighed 7 lbs. and 4 oz. and measured 20 inches in length. Both Bethany and Peter Ambrose are recovering from their struggle, and both are in good health. This site will contains a news blog for information updates, a photo and video gallery, and several other opportunities to learn about our son. Please feel free to forward the link and any content on to whomever you think will be interested. Congrats! Peter Ambrose is gorgeous! Blessings on all 3 of you :) ...try to get some rest after your very long day! Congratulations! I love him so much already! What a precious gift. I was thinking of you so much yesterday. It was such a blessing that in the midst of our mourning, we could rejoice in the giving of new life. Sweet baby boy! I love you dear friends, and so thankful that my dearest friends are also my family!!! God bless you! Copyright 2009 Mile High Baby.